Professionalism, creativity and experience mark out Vern Allen Event Services as a major force in the audiovisual world. All of this is placed at your disposal, ensuring a memorable and hassle free event. Whatever your product, large or small, we can show it to its best advantage through our expertise and creativity, always working closely with you to realise your vision. 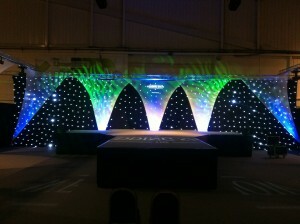 Whatever your requirements, we have the stock, the experience and the quality to make your product launch a success. We can supply a simple self operated PA, lectern and projection package, or a full staging, gantry, concert PA and lighting, multi screen stage set complete with technical engineers and stage management, all to the very highest professional standard. For the launch of your new product, whatever it might be; phones, computers, food and drink products, clothing, holiday homes, automobiles, or any other design or product you may have, we can help you to promote it in a professional environment, sensitive to your company profile and image, in the surety that our experience, cutting edge equipment and commitment to your product will win the day!